Finding the Pennies: musicMagpie: How I Found MANY Pennies! If you know me or have been following my blog, you know I LOVE to save money wherever and whenever possible. Perhaps you do, too! Yay! You know that feeling when you reach into your pocket and you find a pound or a dollar? Or when you're clearing out a drawer and you find a few pennies in the bottom? How do you feel? Excited, right? Now imagine that all of your unwanted books, CDs and DVDs - and our case, two old iPhones - are small stacks of coins. Imagine collecting all of those coins into a purse. What do you have? Money! Money that has been collecting dust on a shelf! Yes! We received a payment from musicMagpie for £56.40! How? 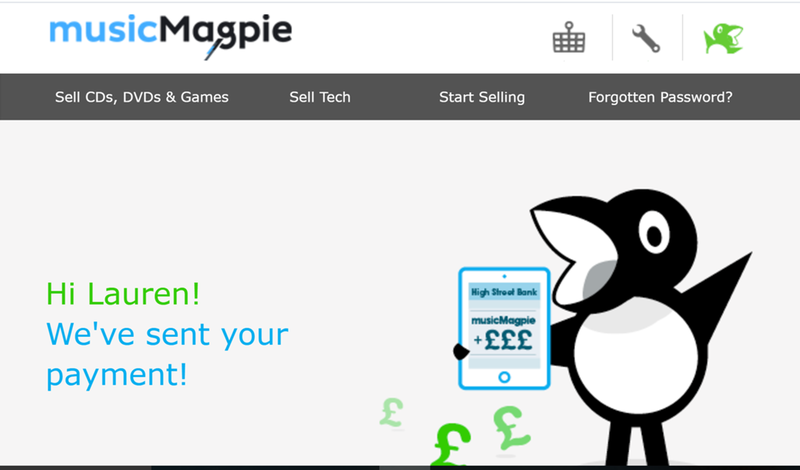 In case you aren't familiar with musicMagpie, you send them your unwanted electronics, books, DVDs, CDs and games and they pay you for them! How? Go online to musicmagpie.co.uk or download their app. With the app, you can use the bar code scanner and find out instantly what they will be willing to pay you for your unwanted item. Now, you may be a little underwhelmed with the amounts, but those little figures add up. So among various books and DVDs, we had two old iPhones. My old one was still working, but old and I didn't want it. My husband's phone was 100% dead and destined for the recycling bin. When I was entering in the details on the app about the phone, I even ticked the box for "faulty" condition, but I didn't think they'd pay us for a dead phone. They did! £13! We almost threw £13 in the bin! The amount that you are told you will get on the app isn't guaranteed, but it's an estimate. We boxed everything up, asked for FREE pick-up service and waited a few days. They sent an email to say that our order had been received. A few days later we received the above email and payment into our account. It was so simple! MusicMagpie hasn't paid me to write this post, but I highly recommend it as a way to find a few pennies... or a lot!